Located at the gates of Provence, in the Var, at the foot of the village of Muy, Camping La Prairie *** welcomes you in a zen and family atmosphere in an oriental setting. At 20km from the beaches of Fréjus, Sainte-Maxime or Saint-Raphaël, the village of Muy is divided between the Mediterranean Sea and Provencal landscapes of the hinterland dotted with medieval villages where the Verdon has dug its spectacular gorges . The campsite has a vast aquatic complex of 1600 m² that will delight young and old. Open from April to September, this new heated space (except in July / August) is indeed equipped with slides, a river against the current, a large pool or a balneo area. All with a decoration with oriental influences adorned with Buddha statues. In July / August, a team of animators will punctuate your stay with daily entertainment (Monday to Friday) and sports tournaments. After a busy day, come see you in the evening around shows for young and old (magic, cabaret), dance evenings, concerts, family games ... and much more! From early July to the end of August, La Prairie campground takes care of your children. A Kids Club (from 4 to 12 years old) welcomes them from Monday to Friday for manual activities or outdoor games. This will be an opportunity for your children to make friends and make unforgettable memories of their stay at Le Muy. In order to make your stay as pleasant as possible, the campsite has quality services and especially a snack bar - restaurant where you can choose to eat in the room with the atmosphere of a village bistro or take dishes to take away in order to have dinner on your site. In addition to this restaurant, you will find on the campsite a bread deposit. You will also find a wifi * point, a launderette * and safes *. The village of Muy is ideally located for those wishing to discover the Var without limiting itself to its beaches. Of course, the sea is only 20 km away with sandy beaches, coves and coves, and it will be easy to get to Frejus or St Raphael to indulge in water sports (sailing, windsurfing, diving , water skiing, etc.) or simply swim in the warm waters of the Mediterranean. But the Muy is also an excellent starting point to discover the Var hinterland and Provencal landscapes: the colorful markets with southern scents, Lake St. Croix and its perched villages such as Moustiers-Sainte-Marie, the vertiginous gorges where the Emerald waters of the Verdon, the Massif des Maures and the Estérel massif wind, etc. 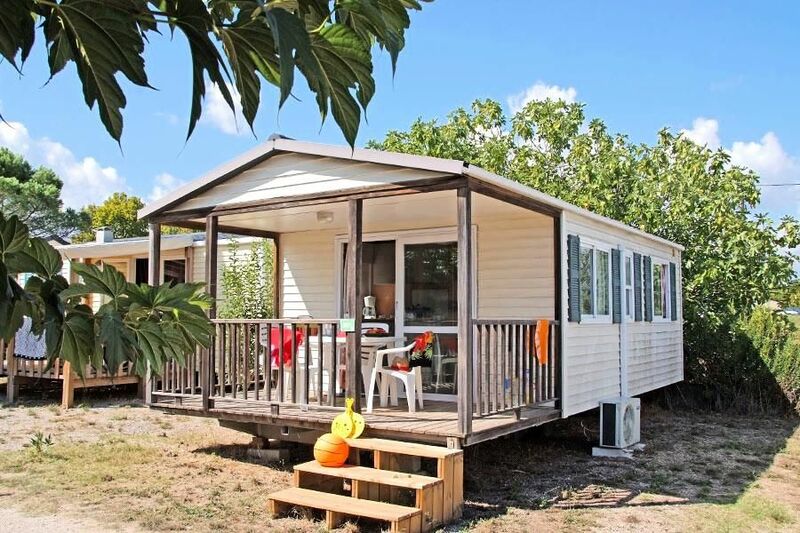 Mobil Home Marina 3 rooms 4 persons of 21m ² approximately air-conditioned, composed of a corner living room, a corner cooks equipped, a room with a double bed (140x190), a room with 2 simple beds (70x190), a shower room, separate WC and a covered terrace. The Mobil Home includes a lounge area with TV, a kitchen area equipped with fridge, microwave, capsule coffee maker, cooking utensils and crockery adapted to the number of people in the accommodation. The terrace has a garden furniture. Note: The bed sizes mentioned are non-contractual. It is possible to have slight differences in sizes depending on the rental models. The layout of the beds and the decoration may also vary. Take the A7 / A51 towards Aix en Provence then the A8 towards Nice. Take exit 36 ​​direction St Tropez and continue on the N555 to Le Muy.